"My teacher said the district doesn't want us telling our parents what we talk about in school and what we see on the tests. But my teacher says that's wrong, we should tell our parents what's going on." I am grateful to his teacher for being willing to say "THAT'S NOT RIGHT, I'm not doing that". But the fact that needed to be said at all answers any questions I had as to Common Core's intentions. Asking personal information about their homes is a MILD example of the invasive questioning of our elementary school kids. If my experience was the only I'd heard of, I might blow it off. I might think "maybe he misinterpreted what was said". But examples like this are popping up ALL OVER the US with the implementation of CC. (In case you're interested, there are Twitter accounts and facebook pages dedicated to documenting these strange questions students are getting in class, like "why are books bad and video games superior?") The questions are mild, not setting off that "wtf" alarm we have in our heads, but conditioning our kids to divulge personal details in the school setting. One of the things that scares ME most is the data mining. The "research" that is being done on our kids (who apparently look like guinea pigs to the companies driving this) is at the very least, invasive. At the very most, terrifying. There are many, many ways they are tracking and monitoring our students. This article explains just one of the ways: the 1.1 million dollar galvanic bracelets to track student "engagement" (and identify the most persuasive teachers): Read it here. Currently living in Utah, moved here from Sweden a year and a half ago, I am very troubled by Common Core. In Sweden we have had a single national curriculum for decades now. No deviations from the government-designed curriculum are allowed. Home schooling has been criminalized, and people have had their children irrevocably taken away for attempting it. Schools have been turned into propaganda centers to instil (anti-religious) values, endlessly talking about bullying, racism, equality, environment, feminism, eradicating gender, promoting liberal sexual values etc. Not much time left for acquiring knowledge and developing personalities. Make now mistake about CC, a national curriculum is the ultimate goal, and getting home schooling under control. In Sweden it started in the 60s after a major national school reform. Teachers were vehemently opposed from the start but were unsentimentally run over. It takes some time for these things to take full effect, but today it is obvious to everyone in Sweden that the school system is in shambles. The latest PISA report was a wakeup call even to the blind. Schools are now the #1 item on the political agenda. Unfortunately, after so many years of government control of the school system people don't understand that sovietization is the problem. Most cannot even imagine a liberated school system anymore, but believe it is just a matter of finding better central planners and the perfect central plan. If I can do anything here in Utah to combat CC I would be very interested. I can give talks or write articles or whatever. With my experience I can provide a look into the future and show how this beast will develop if it is not destroyed. This is nothing short of terrifying. Are we still willing to sit around and say we are immune to such circumstances because we are "The great United States of America"? While this is frustrating, it's not anywhere near my biggest concern. WHICH HADN'T EVEN BEEN WRITTEN YET. 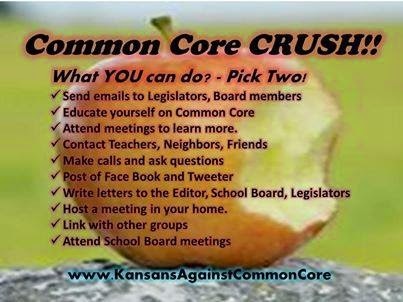 Knowing this data collection/money-making is the goal, do you think they will give up if Common Core is overthrown? Not a chance. We will still need to be vigilant in keeping this invasion away from our kids. They were counting on the SILENT approach of CC, to sneak it in under our noses, hoping we wouldn't notice until it was too late to reverse it. THIS WE CANNOT ALLOW. Did we vote for this? 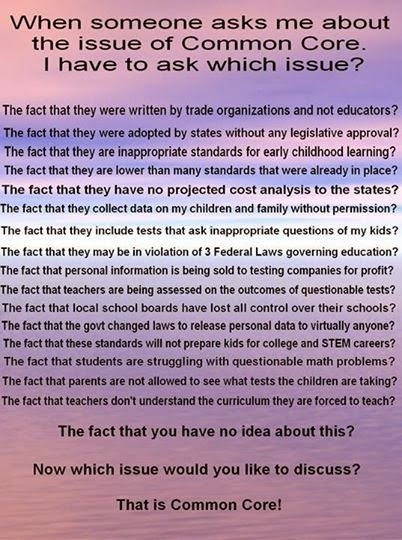 Were there test groups and statistics showing this would benefit our children and the future of our country? Did we see this in the media? Nope. There's a reason for that. Isn't the media always ANXIOUS to bring controversial issues to our attention? Why, then, has this gone almost entirely unmentioned? Controlling, abusive relationships don't start with a black eye. They come on silent feet, with appealing promises, a slight grip on your neck, tightening ever-so-slightly until you can't make a move on your own. And please, please spread the word.